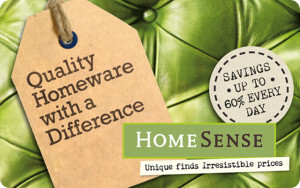 As part of Europe’s largest major off-price retailer, HomeSense offers a fabulous range of unique, branded and quality pieces for your home and garden. Our buyers scour the globe for designer and one-off pieces for home and garden so you can enjoy savings of up to 60% less than the recommended retail price. New deliveries arrive every day – you never know what you might find in store. There’s truly something for every style, every room. Our gift cards can be used in all 30 HomeSense stores right across the UK as well as in over 250 stores of our sister company TK Maxx.